For over 40 years, the Graduate Tax Program at the University of San Diego School of Law has produced skilled leaders in the field of tax law. The University of San Diego School of Law is proud to be among the finest institutions providing graduate education and skills training in tax law. 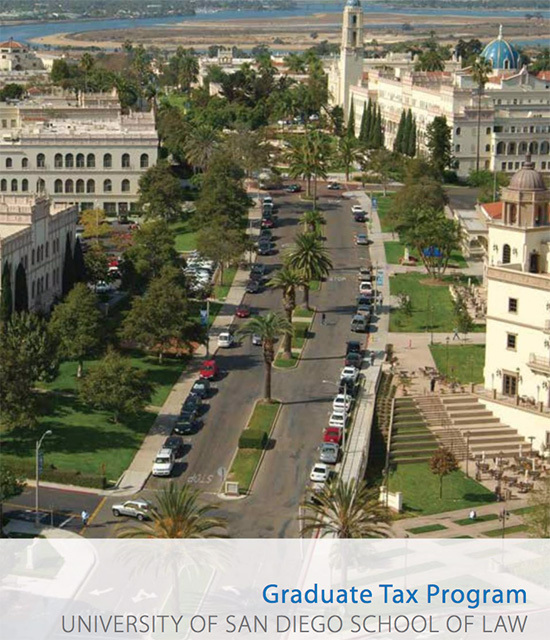 As one of the nation's top tax LLM programs, USD's Graduate Tax Program is the ideal choice for candidates who wish to study in the western United States. Graduates join our extensive network of LLM in Taxation alumni practicing throughout the West Coast and the nation. The LLM in Taxation and Diploma in Taxation programs provide candidates with the necessary theoretical and practical framework that employers require. Through intensive study, students develop a broad skill set in traditional tax lawyering skills. In addition, students gain a deep understanding of the policies forming the basis of our tax laws and Internal Revenue Service pronouncements and are able to analyze the various proposals for tax reform and their correlation with current tax laws. The LLM in Taxation and Diploma in Taxation prepare attorneys for the private practice of tax law, for in-house counsel positions, for positions in the tax departments of businesses or allied professions, as well as for academia.